Can we just agree on the fact that lime juice, cilantro, and avocado make everything feel a little bit better? We've been on a kick to eat more vegetarian meals this January (with my husband giving up meat altogether) and now that we have a kitchen again, I've been happy to dig through recipes new and old. (If you know me in real life, you know we've been renovating our house for a while - and lived without a kitchen for quite a bit of it - so cooking feels fun again). These sweet potato tacos are an easy weeknight meal, an easy way to add a vegetarian dish into your rotation, AND they're super delicious (not to mention those colors!). We probably eat them once every other week and so far, anyone we've cooked them for enjoys them as much as we do. The girls aren't super excited about them but they're kids. And they don't like sweet potatoes. Neva requests steak every single night of the week but she's out of luck right now. Basically, I deconstruct the tacos for the girls and they either nibble at the separate components or play at putting the taco together and then nibble at the separate components. Eating vegetarian dinners with two little kids isn't the easiest but 28 days in - it has gotten easier. So let's talk about these tacos. It's basically a mix of sweet potato, black beans, and a cabbage slaw soaked in lime juice (there's A LOT of lime juice in this recipe). I peel and dice up the sweet potatoes in advance and then toss them in some olive oil and lime juice right before roasting them. As the potatoes are roasting, you can work on the slaw and beans. I use a small yellow onion and mix half with the slaw and the other half with the beans. 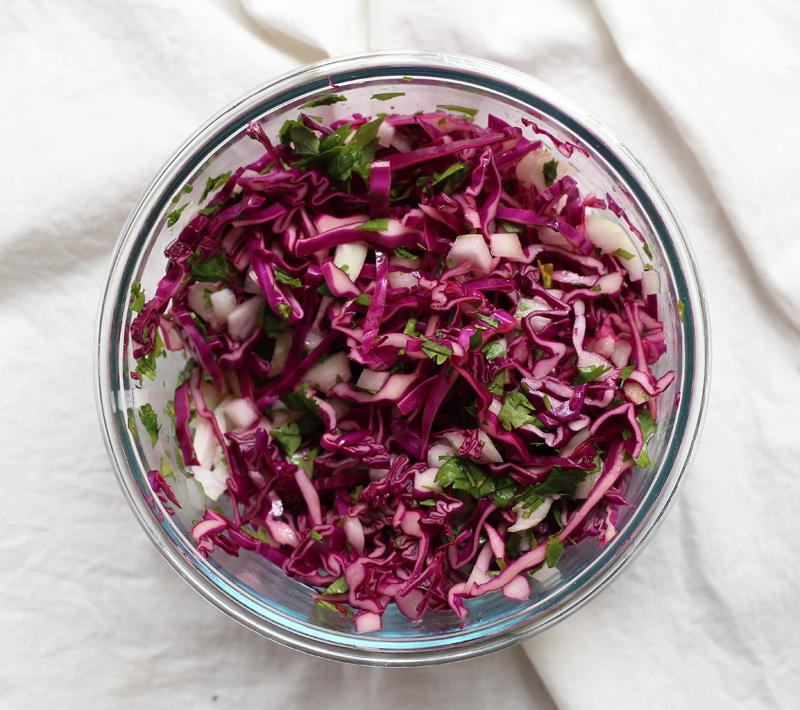 For the slaw, you shred up some red cabbage (which keeps FOREVER in the fridge so don't feel pressure to use it up) and mix it with 1/2 a diced onion, some cilantro and lots of lime juice. The other half of the onion goes in a pot with some olive oil. Once the onion is soft, throw in the black beans, some cumin and some, you guessed it, lime juice. Throw all the ingredients together on a corn tortilla and add a few slices of avocado because it makes everything better and you've got yourself a meal. I hope you enjoy these as much as we grown ups do. Preheat the oven to 400 degrees. Toss your diced sweet potatoes with 2 tbsp olive oil, salt, and the juice of one lime. Add some red pepper flakes if you like (we leave them out because of the kids). Place them on a cookie sheet and roast for 20-30 minutes, depending on the size and quantity of the potatoes. I like mine to have a little bit of charring. Meanwhile, combine the cabbage, 1/2 cup of yellow onion, and cilantro in a bowl. Toss with the juice of two limes. Heat 1 tbsp olive oil in a small pan. Add 1/2 cup of onion and heat until softened, about 3 minutes. Add the black beans, the cumin, and the juice of one lime. Cook until heated through. 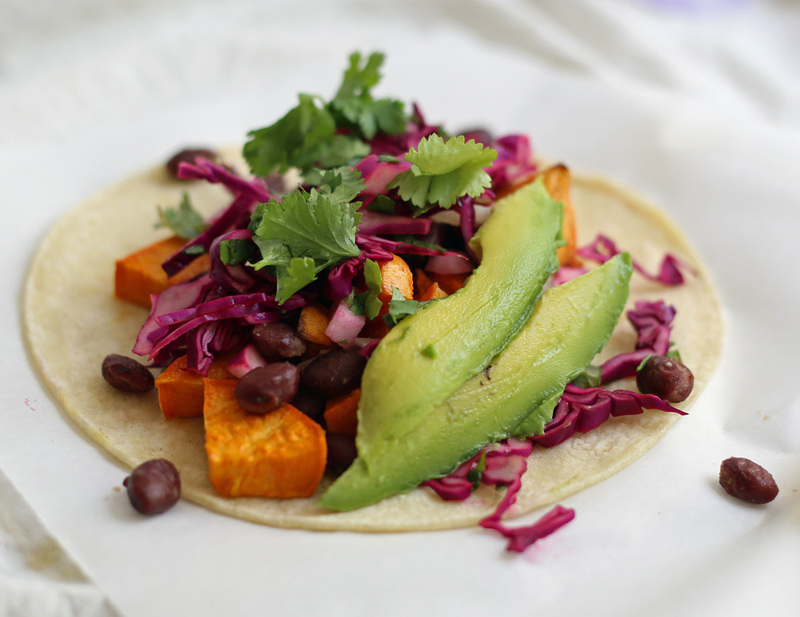 Warm your corn tortillas and top with sweet potatoes, slaw, black beans and a slice or two of avocado. If you eat dairy, some queso fresco on the top is also delightful.